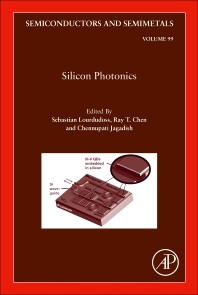 Silicon Photonics, Volume 99 in the Semiconductors and Semimetals series, highlights new advances in the field, with this updated volume presenting interesting chapters on Transfer printing in Silicon Photonics, Epitaxial integration of antimonide-based semiconductor lasers on Si, Photonic crystal lasers and nanolasers on Si, the Evolution of monolithic quantum-dot light source for silicon photonics, III-V on Si nanocomposites, the Heterogeneous integration of III-V on Si by bonding, the Growth of III-V on Silicon compliant substrates and lasers by MOCVD, Photonic Integrated Circuits on Si, Integrated Photonics for Bio- and Environmental sensing, Membrane Lasers/Photodiodes on Si, and more. Sebastian Lourdudoss obtained M.Sc. in chemistry from (St. Joseph’s College, Trichy) Madras University, India, in 1976 and Ph.D. in chemistry from Faculté Libre des Sciences de Lille, France, in 1979. In 1980 he joined KTH, Stockholm, Sweden, to work on chemical absorption heat pumps and thermochemical energy storage. He changed his field of interest to semiconductors in 1985 when he had moved to Swedish Institute of Microelectronics, where he started to develop epitaxy of compound semiconductors for fabricating optoelectronic devices. In 1993 he moved back to KTH where he is currently a professor in Semiconductor Materials since 2002. 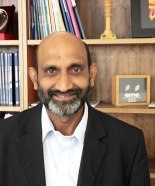 He has contributed to the development of semi-insulating III-V materials including III-nitrides for discrete and/or integrated device fabrication and buried heterostructure lasers for high speed data- and telecom applications. His current interests are integration of III-Vs on silicon, high power buried heterostructure quantum cascade lasers and semiconductors for non-linear applications. He is a senior member of IEEE. He is a recipient of IPRM award in 2017.